Parish Council in 1896, there was an earlier booklet dated 1882. Records in the late 1800’s note that 'Mr Richard Ward, a local joiner, was to fence with three year old quick and plants of privet'. Woodborough cemetery is in a peaceful spot on the top of the hill but it is a steep climb for some. In view of the distance between church and the cemetery, and the steep hill, a horse-drawn cart or hearse owned by the Parish Council was kept at the cemetery lych gate. The structure was built in 1879 by local carpenter Mr Richard Ward and enclosed by doors at both ends. Local undertakers could have provided a Shillibeer, which is part hearse and part carriage; in fact the late Mannie Foster had often referred to one being used. A reference to a hearse being used is mentioned in the Fees and regulations for the new cemetery dated 4th July 1879. This was kept by the parish to be used for the funerals of the poor who could not afford an undertaker with cars; a black horse would have been borrowed from a local stable. Mrs Eileen Flower, Miss Elsie Leafe, Mr Eric Ward and also the late Mr Sydney Savidge have all confirmed at sometime that a hearse was in use in Woodborough and stored as described above. Mr Savage, a Woodborough painter and carpenter, would build coffins and arrange funerals with Baguley Bros. The Woodborough hearse is described by Mr Ward as being a horse drawn cart with etched glass windows fitted and had two doors to the rear. There appears to be no records of when this vehicle ceased to be used, but it is likely to have been about 1940. The lych gate shed was demolished in 1966, in its place, stone pillars were built and wrought-iron gates installed all for a cost of £168. The history of the village cemetery is outlined over three periods, the first cemetery from 1879, the second (first extension) from the early 1960’s and the third (second extension) from 2012. There then follows a list of burials which has been recently updated. It was finally agreed that one acre of glebe land in Moor Field be purchased from the then incumbent, The Reverend Frederick Goode Slight. The plot of land is at the top of Roe Hill and when opened in January 1879 it was decided that the site should be divided equally through the middle by a four-foot gravelled pathway, with Dissenters to be buried in the south side and church people in the north side. 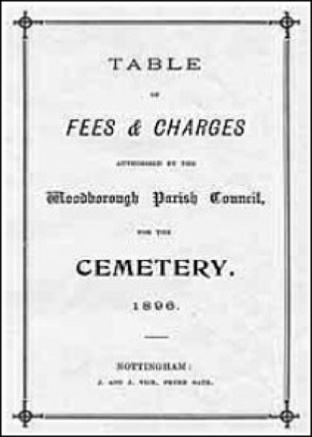 The following document outlines all fees payable from the 4th July 1879 this was the date when burials commenced at the Roe Hill cemetery, note the reference to a fee (unspecified amount) for use of a hearse. Left: The Roe Hill lych gate as viewed from inside the cemetery, it was built by Richard Ward in 1879. The structure was demolished in 1966. Right: The cemetery entrance from the roadway. The Google Earth aerial photo above shows clearly the extent of the present cemetery and the rough land to the west & north-west. The lane on the extreme right is Roe Hill. David Rose took the following photographs in February 2012 as the site was being prepared for ground clearance, new hedging and new fencing added together with a driveway and turning circle. Burial listings for the cemetery follow on the next page, all enquiries should be made to the Parish Council. Sometime before 2007 Woodborough Parish Council [PC] decided the cemetery should be extended to cater for the village’s needs to the end of the 21st century. A sum of money was put aside for the subsequent purchase and development of a suitable piece of land, the whereabouts of which would be determined at a later date. In 2008 the PC decided to go ahead with a cemetery extension and various plots of land, all adjacent to the current cemetery, were assessed for their suitability. Following this assessment it was concluded that the two triangular plots of land adjacent to the North and West boundaries, and used as rough land by the Springwater Golf Club, offered the most beneficial outcome. There were a number of reasons for this, some geographical and geological but also because the land contained Japanese Knotweed, a virulent weed that was wont to spread and cause all sorts of damage. The PC was of the opinion that it would rather have the infected ground under its control than leave it to a disinterested third party. Cllr Richard Wincup, as Councillor responsible for the cemetery instigated primary discussions with the Springwater GC and after agreement in principle the land was surveyed on our behalf in order to satisfy the requirements of both Gedling Borough Council and the Environment Agency. The results satisfied both agencies so a formal offer was made to the Springwater GC and the land was marked out and measured by accurate GPS survey. Springwater GC imposed a number of non-contentious conditions on the use and format of the land, i.e. a stock-proof fence was to be erected and also a mixed hedge should be allowed to grow and mature before any burials could take place. This was to protect the playing golfers from any visual disturbance. For reasons that are not entirely clear, the purchase wasn’t completed until June 2012, but earlier in the year the PC sought and was granted permission to begin erecting a fence and clearing the area. Cllr John Charles-Jones was instrumental in managing both these processes to a successful conclusion, and subsequent to final purchase he also managed the building of an 18 metre turning circle inside the new extension. This will allow hearses and vehicles containing disabled mourners to travel all the way up to the new area rather than having to walk. As a further aid to access it is proposed that the metal gates at the cemetery entrance are widened in due course. With thanks to Woodborough Parish Council for providing the above information. Mr Ward confirms that according to his brother's recollection, it was used for the funerals of Joseph Smith (1942) and his son Spider (William Smith circa 1930) both of whom lived in a cottage in what was Johnson's Yard, but he cannot remember when, though it would have been in 1942. Mr Ward can certainly remember this hearse being kept at the cemetery in the 1930's and 1940's and when there was a funeral it was wheeled outside so that the coffin could be carried through the building. However, what is not totally clear, did the "Woodborough hearse" acquire the name Shillibeer, or was it a true Shillibeer? Richard Ward, who made coffins and arranged funerals in the 19th century, would certainly have used such a vehicle, later Len Hogg, who lived and had a workshop in the cottage next door to the Old Forge on Main Street, and there was also Mr. Arthur Nurcombe. Funerals for Woodborough people were also arranged by a Mr. Jack Patching (an uncle of Mannie Foster) and Doughty's of nearby Oxton. These people regularly used Baguleys of Sherwood. Within living memory, a black horse was provided by Edwin Spencer to draw the hearse, though it is thought not to have been used very often after the motor car became popular. Since the cemetery on Roe Hill opened in 1879 there have been over 1000 burials to date. Woodborough Parish Council continue to manage the Cemetery and are currently  negotiating to purchase an adjacent plot to extend the site again. Earlier, during the 1960's there was a need to extend the cemetery and an adjacent plot was purchased. This new portion of the cemetery was consecrated by the Lord Bishop of Sherwood on the 18th May 1968 with vicar of Woodborough Rev'd Alfred Ross Hayward. Above: This plan, with an outline of the land purchased from the Springwater Golf Club being edged in red, is taken from a planning application submitted to Gedling Borough Council. The extent of land covered by the existing cemetery can be seen stretching from Roe Hill, west towards the new extension. If you are using Microsoft Edge to browse this website, you may have problems seeing some or all of the photo galleries on this site. This is due to security settings that Edge defaults to. To overcome this problem, click on the “lock” symbol, this is found to the left on the address bar, then enable “Flash” for this site. Follow this by rebooting, or refreshing the page. The photo galleries should now be fully functional.